What are the benefits of Resistance Soldering? This technique, using carbon electrodes and the passage of an electrical current between one or two electrodes, generates the heat required. 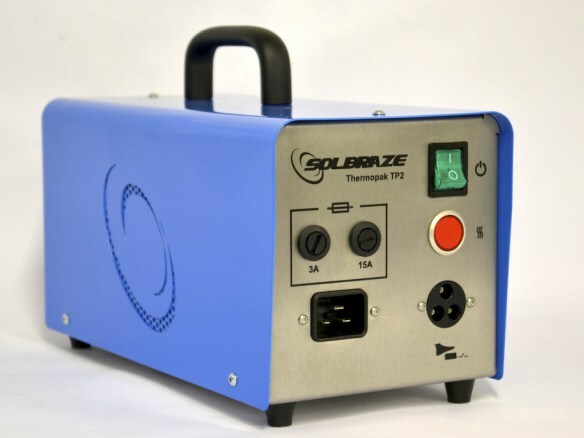 By comparison with other heating and soldering methods, it is a simple, clean, efficient and effective unique way of raising the temperature of any ferrous or non-ferrous material. Whether it has a small or large thermal mass, no damage is caused to any surrounding areas of the product/s that may be of a temperature sensitive nature. This is due to the advantage of being able to selectively position and alter the size of the carbon electrodes to whatever heating area is required. As with preheating ferrous or non-ferrous materials the same benefits apply to this method in that small or large thermal masses can be rapidly brought up to the required temperature to enable the solder joint/s to be made. In certain instances, should the two component parts be required to be soldered together, once the alloy has “wetted the joint” and a fillet formed, the electric current can be turned off and the jaws held together for a few seconds. The jaws of the tong tools can then hold the component part/s together until the alloy has reached solidus. What type of solder do I need for my Resistance Soldering? Any composition of leaded or unleaded alloy can be used in resistance soldering. Wire, bars, ingots or stick forms can be used with flux either as an addition to the solder or within the solder itself. Higher melting temperatures, and consequently, higher joint strengths can be found in the alloy compositions of Copper, Nickel, Brass, Bronze, Palladium and Gold. All these alloys have tensile compressive and shear strengths (depending on the family) between 10 to 30 times greater than soft solder alloys. This technique is a favoured by manufacturers and repairers of the complete range of small, medium and large electric motors, stators, transformers and cutting tools where tungsten carbide inserts known as ‘tool tipping’ are brazed onto the base material. The brazing alloys generally used are of a copper or copper alloy specification. 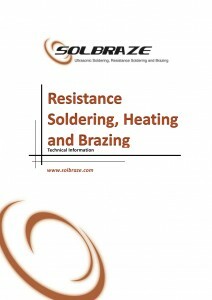 Brazing alloys with melting temperatures up to, and in excess of, 1000 °C can be reached using the Resistance method. These alloys can be ‘rod fed’ to the component part by hand, preplaced as a specific shape perform size or into rings, half or multi turn types. Why is preheating needed for certain applications? Preheating is required for certain types of products where the temperature of a ferrous or non-ferrous material needs to reach a certain temperature, e.g. shrink fitting of bearings etc. These metals are often good conductors, or heat sinks. This means of direct heating is a quick and efficient way of achieving the desired temperatures. The thermal mass of these metals is such that it would not be possible to increase the temperature for a soldering, tinning, brazing or a shrink fitting operation, or any other form of interference fit, on any form of material of a metallic nature. This effective preheating technique can then be used. The benefits are that it is possible to achieve increases in temperature without subjecting the specific product or its associated component part or parts to any other heating techniques, such as, flame impingement, hot air, and infrared heating, where damage could occur to possible temperature sensitive areas of a nearby product or an assembly. The heating is localised and can be applied to a specific product area or areas.